The Loire Valley offers something for everyone. The Loire Valley châteaux are magnificent; there are gardens to wander through full of orchards of fruit trees and sweet-smelling flowers, plus great accommodation, festivals to enjoy, vineyards to sample and now the Loire Valley cycle route. Here is my list of the top attractions and things to do and see in the Loire Valley. Of all the gracious châteaux that fill the Loire Valley, the château of Chenonceau is a real favourite. Spanning the river Indre which flows slowly through its lower arches, this Renaissance masterpiece is known as the Ladies’ Château. Started by Katherine Briconnet in 1515, it was Diane de Poitiers, mistress of Henri II, who built the characteristic aches spanning the river, and Cathedrine de Medicis, the wife of Henry II, who built the two-storey gallery on the bridge modeled on Florence. The interior is just as captivating, full of tapestries, furniture and paintings decorating the high-ceilinged rooms. Cross the long gallery over the bridge where Catherine de Medicis held infamous parties. The door at the end leads out to the gardens which stretch out in a series of themes, from Catherine's garden with its sweet-smelling rose trees to the impressive vegetable garden and a maze. In July and August, the gardens are open at night letting you wander through at your own pace, listening to Italian classical music. The Apocalypse Tapestry in Angers is much less well known than the Bayeux Tapestry. That's understandable: the Bayeux tapestry tells the story of the conquest of England by William the Conqueror so it's taught at schools in Britain from a very early age. But in terms of sheer drama, the Apolcalypse Tapestry wins. The tapestry is vast, exhibited in a large darkened gallery in the castle at Angers, and it put the fear of God into me when I first saw it. The story is divided into six ‘chapters’ following the last chapter of the New Testament and shows a series of prophetic visions that illustrate the return of Christ, his victory over evil, and the end of the world. It was not just a telling of the Bible, it was also intended as a political statement during the Hundred Years War between England and France. The colours are amazingly vivid; the details of horrors and persecution frighteningly graphic. It’s a good idea to make sure you know a bit about the Apocalypse story before you go as you’ll get much more out of the images. Don't miss the magnificent and often overlooked, Ainy-le-Vieil, one of the great Loire Valley chateaux, located just south of the cathedral city of Bourges. From the outside, the château looks like a fortress with massive walls and a defensive gateway complete with drawbridge and moat. In the same family since 1467, Ainy-le-Vieil has remarkable interiors, complete with fireplaces and personal mementoes of past owners. But it’s the chateau's gardens that are the main attraction. You walk through a series of different garden ‘rooms’, each with a separate theme and character. There are English herbaceous borders, walled gardens full of espaliated fruit trees, a poet’s garden and a rose garden which intoxicates you with its colours and scents. The château dominates the pretty riverside city of Blois, overlooking the Loire Valley. In the 16th century, six kings of France stayed here and each left their mark on the architecture and history of Blois which was as bloody and treacherous as anything you can imagine. .
You walk into the cobbled courtyard to be greeted by different facades, from medieval red brick to mellow white stone which span four centuries of architectural styles. With such a dramatic story to tell, Blois château makes a perfect backdrop for the son-et-lumière performances that take place in the summer. Take the headphones for the English sound version and watch the lights dance across the darkened façade as figures mysteriously appear and disappear and the story unfolds. Notre-Dame d'Orsan, a former priory built in 1107 as part of the Abbey of Fontevraud, stands in rolling peaceful countryside. The surrounding remarkable gardens have been designed and planted by two architects, inspired by the tapestries and illuminated manuscripts of the Middle Ages. The feeling is of stepping back into the masterpiece Les Tres Riches Heurs du Duc de Berry. These are gardens to delight, from a maze to an orchard full of fruit trees, from a rose haven to a green cloister. Notre-Dame d'Orsan is south of Bourges in a little village called Maisonnais, between Chateauroux and St-Amand Montrond, just south of Lignieres. The Loire à velo cycle route stretches 800 kilometers (500 miles) from the little village of St-Brevin-les-Pins on the Atlantic coast through the cities of Nantes, Angers, Saumur, Tours, Orleans and down to the village of Cuffy in the Cher. Unless you have plenty of time and are very fit, take just a section of the route. The route is well organized, with easy cycle and equipment hire, recommended hotels and accommodation that look after cyclists and their equipment, signposted flat roads and paths to ride on beside the Loire river and lots of information from the website. There are also side routes that you can take concentrating on a theme such as Loire Valley châteaux. 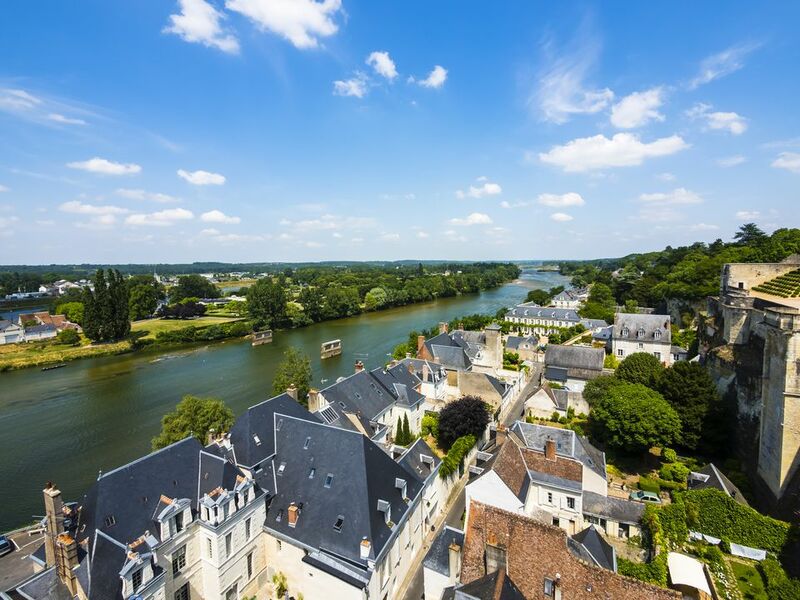 You go at your own pace, stopping during the day for sightseeing, a picnic under the fruit trees that provide the Loire Valley with so much produce, or just a rest on the banks of the river. The 12th-century Cathedrale St-Etienne at Bourges stands out over the surrounding countryside, making a remarkable landmark. It’s one of the great gothic cathedrals of France, now a UNESCO World Heritage Site. Modelled on Notre–Dame in Paris, the builders of Bourges went further in daring architectural innovations, allowing delicate flying buttresses to support the whole nave, making it soar upwards to the heavens, and as the medieval mind believed, to God. The 12th to 13th-century stained glass is astonishing; take a pair of binoculars with you to pick out the details of the biblical stories. The best glass, created between 1251 and 1225, is around the choir. It tells the story of the Prodigal Son, the Rich Man and Lazarus, the life of Mary, Joseph in Egypt, Christ’s Crucifixion, the Last Judgement and the Apocalpyse. With its superb climate and rich soil, the Loire Valley produces some of the best fruit and vegetables in France. Each part of the Loire Valley has its own specialities. Around Bourges, it’s the green lentils of Berry; you must eat tarte tatin, the upside-down apple tart in the Sologne where it is said to have originated; in Anjou, around Angers, the garden area of France, try the greengages and the Anjou pears that come from the local orchards. In spring local asparagus is prepared in a whole variety of ways. The great sweeps of forest produce a rich crop of mushrooms, while the champignon de Paris variety is produced in the caves around Saumur. Freshwater fish is a feature, with the many rivers of the valley producing their own delicacies. Salmon and lamprey spawn in the Loire; try filet de sandre (pike-perch) with beurre blanc sauce; and local eels cooked in red wine for a dish called matelote d’anguilles. Pork appears in the famous 17th-century dish of noisettes de porc aux pruneaux de Tours (pork with prunes, cream and white wine) and saucisses au Muscadet, a blood-thickened sausage with onions. The Loire Valley has always been known for its charcuterie, so try the local pates, terrines, rillettes and preserved sausages (saucisson sec). Game, caught mainly in the Sologne, is another feature of Loire Valley cuisine. You’ll find pheasant, pigeon, duck, quails, venison and wild boar on seasonal menus throughout the region. Goat’s cheese is made particularly in Touraine; also try Ste-Maure and Selles-sur-Cher and the better known crottin de Chavignol. If you’re in the Loire Valley in the summer, try to find a ginguette. Originally drinking establishments that could also be restaurants and dance venues (the name guinguet means a sour while light local wine), you’ll find them along the banks of the river. These seasonal restaurants are delightful; ask at the local tourist office for addresses. The Loire Valley is home to many of the well known wine names, from Sancerre and Pouilly-sur-Loire in the east to the wines of Touraine in the west. The favorable climate and the soil make the area a natural vine-growing region and it’s been making wines since the 5th century. Depending on where you are, go into the local tourist office and pick up maps of vineyard routes, with details of wineries open to the public. They will also have details of local guided excursions. In Sancerre, check out the Maison des Sancerre which has an exhibition explaining the local viticulture, plus information about the local vineyards, maps, and excursions as well as a well-stocked shop. In Tours, visit the Touraine Wine Museum in the cellars of the 13th-century Saint-Julien abbey. Here you’ll learn the story of wines in the Touraine region through the exhibits which range from costumes of the wine brotherhoods of Touraine to glassware. The International Garden Festival at Chaumont-sur-Loire is an annual event, taking over a large part of the gardens at Chaumont, one of the Loire Valley chateaux. Each year there’s a different theme. Lasting all through the summer from the last week of April to the end of October, this is one of the highlights of France’s garden calendar. International garden designers are invited each year to produce a garden around the theme. It’s much wackier than the British Chelsea Flower Show, with humour and fantasy playing major roles. Sounds and lights, as well as flowers, plants and fruit trees fill each of the 15 or so gardens where texture and scents are equally important.